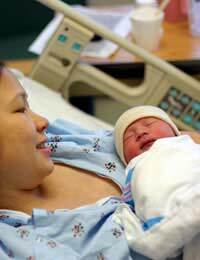 When you're giving birth, you'll no doubt want to know what pain relief methods are on offer. The four main medial options are gas and air, pethidine, epidural and a TENS machine and they each work in different ways. As the name suggests, gas and air is quite literally a mixture of gas and air. It contains 50% nitrous oxide and 50% oxygen and is sometimes called Entonox. In hospitals, it's administered through a mouthpiece or face mask and is centrally supplied to all the delivery rooms, but if you're having a home birth, the midwife will bring along a cylinder to use. Gas and air is best used during the first stage of labour, when you're having contractions. The idea is that you put the mouthpiece into your mouth or the mask on your face, and then breathe in deeply at the beginning of each contraction. It takes about 20 seconds for the gas to build up in your blood stream and, although it won't take all the pain away, it certainly does take the edge off it. It numbs the pain in the brain centre for about 60 seconds a time, which helps you get through each contraction. One of the benefits of this method is that you can control when you have it, but it can make you feel a bit light-headed, floaty, nauseous and make your throat dry. As an added bonus, the oxygen part of it may be beneficial to your baby. Pethidine is a drug that's a bit similar to morphine. It's given in the form of an injection which is administered by your midwife, usually in your bottom or thigh. The standard dose is 100mg, but if you're small or have previously been affected by strong doses of medications, it's possible to ask for a smaller dose. Pethidine will make you sleepy, so you'll have to lie down, and once you've had a dose, it will last for three to four hours. Pethidine is best used during the first stage of labour, when the contractions are gradually opening up your cervix. It can't be administered if you're about to give birth within a few hours, as it could affect your baby. As well as being used in hospitals, it's also possible to have pethidine if you're having a home birth. Although it's a great form of pain relief, it does have its downsides. Pethidine crosses the placenta to your baby and can affect their breathing, which is why it's not used if you're due to give birth in three hours. Your baby's breathing may become slower and sometimes babies are affected for up to a week after the birth, although a drug can be given to reverse the effect. Things aren't always rosy for women either, as many become very drowsy, have shallow breathing, nausea (but another drug can be given to prevent sickness) and it makes some people really weepy. Some women also feel like they've lost control when they've had this form of pain relief. Some hospitals use other drugs in preference to pethidine, including diamorphine and meptid. The latter can make you feel very sick, but it has less effect on your baby's breathing. All epidurals are administered in the first instance by an anaesthetist, but midwives then top them up when required. There are various forms available and the type used will depend in part on which method the hospital favours. It's always worth asking your midwife at an antenatal appointment which form of epidural is likely to be used. With a traditional epidural, a hollow needle is put into the lower part of your back and a thin catheter tube is fed through it. The rest of the tube is taped along your back to your shoulder and the painkilling anaesthetic is syringed down through it. The effect is quite strong and you'll lose all sensation from your waist down. Due to this, if you have a traditional epidural, you'll have to lie down in bed. In contrast to a traditional epidural, the mobile form is more flexible. It works in a similar way, but with this form the catheter is attached to a pump which gives small doses of the anaesthetic at regular intervals, rather than having the full amount at all in one go. Unlike the traditional form, it doesn't completely block the nerves to your abdomen, legs and bladder, so you can, to some extent, still walk, sit up and go to the toilet. It's effective for two to four hours and won't make you sleepy, which some favour against other methods. A spinal block is a single dose of local anaesthetic which is injected between two vertebrae in the lower spine. It numbs the lower half of your body, so you won't feel anything from the waist down, and works for up to two hours. This pain relief method works quickly and is often used in emergency situations, such as the need for a caesarean section. If you need pain relief for longer, an epidural catheter can be put on and topped up in the same way as a traditional epidural. All forms of epidural can be used from early labour until the cervix is fully dilated, but the downside is that they may add time onto labour, especially during the pushing stage, and your baby is more likely to be delivered with the help of forceps. TENS stands for Transcutaneous Electrical Nerve Stimulation and is a tiny machine that emits electrical pulses. Between two and four wires plug into the TENS with pads on the end, and the pads are placed on your body (e.g. the lower back), where small electrical pulses are emitted. It's not uncomfortable to use and once on, it's possible to forget it's there. TENS can be used throughout labour, but is best started at the beginning – the intensity can be increased as labour progresses. While it can't be used if you're having a waterbirth, you can try it out in advance, which lets you get used to the feeling, and you can move around easily while it's on. Why no mention of twilight sleep or the use of hyoscine on this page? When I was at school (1960s) many local women reported having been under "general anaesthetic" during childbirth as they thought they had been knocked out for the whole process. Of course, this was not true. They had just been given twilight sleep and so remembered nothing. Is the NHS really so hard up that it can't offer hyoscine to all women in labour? It doesn't take the pain away, but it would certainly add to the effect of an epidural and can still be used in conjunction with pethidine (from around 1900 to the 1970s it was routinely used with morphine sulphate but that is now avoided because it suppresses foetal respiration). As one obstetrician put it in 1952, "My patients want to have babies, they just don't want to be there at the time". Anyone who has had surgery but doesn't remember going to theatre or coming back will have been given hyoscine, which has been in use in the UK since at least as far back as the 14th century, so why are so many women tortured during childbirth?